It probably goes without saying, but if you've followed Our Southern Style for any length of time you've probably come to know that I'm a huge fan of everything Berkshire Blanket! I just can't rave about them enough and this latest review is no different. If you don't own a Berkshire Blanket you are missing out on one of life's greatest comforts! Of the six people in our family, not a single one has any desire to go to bed with out their Berkshire Blanket. Travel has become difficult at times trying to fit so many blankets and pillows into our vehicle! 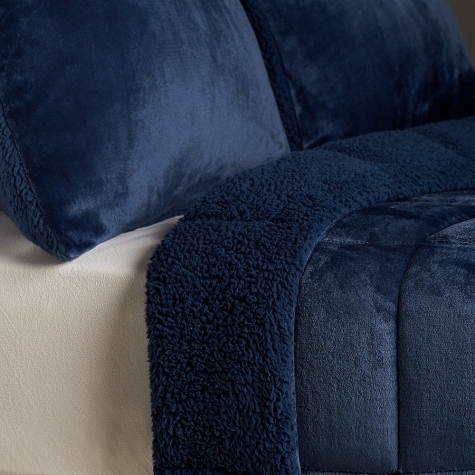 From the rich color of this new set, to the snuggly feel of the comforter and pillow, there's no reason not to love the Reversible VelvetLoft and Sherpa Comforter! Size: Comfortably fits twin, full, queen, and king size beds. The twin is 60x90, the full/queen is 90x90, and the king is 108x90 inches. My boys, Elijah and Levi share a bunk bed with a twin on the bottom and full on top. Levi's my youngest and has been waiting patiently for a Berkshire Blanket of his very own. He'd also been going through a phase where he'd been getting out of bed at night and attempting to hijack my own good night sleep. To sweeten the pot and encourage him to fall asleep in his own bed, I thought the perfect prize would be his own Berkshire Blanket. Once he got over the hump of wanting to be with Mom and Dad, it wasn't long before he'd made it two weeks without any problems and his comforter set arrived. 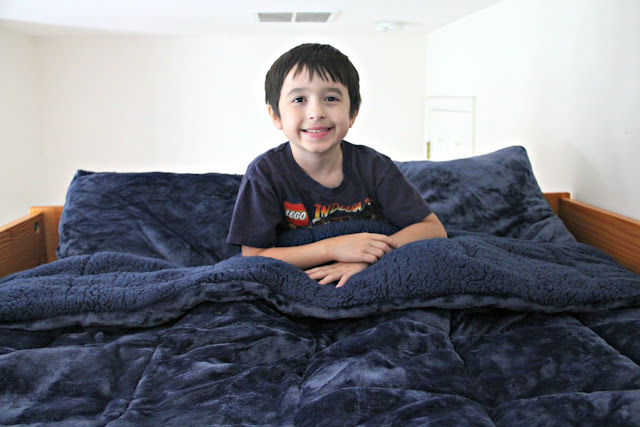 Levi sleeping in his Reversible VelvetLoft and Sherpa Comforter is like bedtime insurance. Now, even if he thought about climbing out of bed, he never wants to turn down sleeping in such soft comfort! 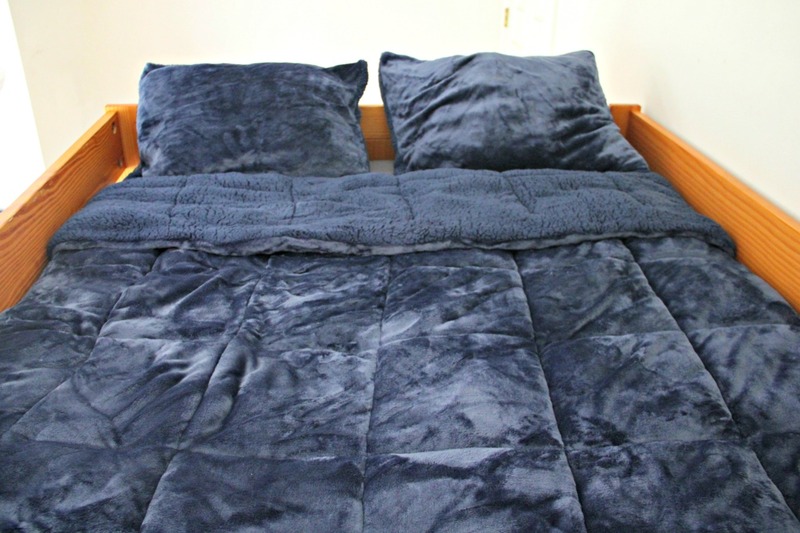 The color of this blanket is so deep and rich and perfect for the boys room! The quality is so outstanding and Levi loves this set so much that I can honestly say he will probably have this bedding through the years as he grows. And can we talk about how warm this comforter is? Being too cold at night is never a complaint I hear with this blanket. So warm in fact that if you are a person who has to sleep with a blanket (like me!) or if you are a hot sleeper, this set would be perfect for late fall and winter but you'll probably want to choose a lighter weight blanket for spring and summer (like the Triple Knit Honeycomb Duvet Set). If snuggling up in a soft blanket wasn't comfort enough, Levi also gets to lay his head on equally comfy pillows thanks to the two shams that go with this set. He is one very happy camper and I'm ecstatic that not only does he enjoy his new Berkshire Blanket set just as much as I thought he would, but that I know he's set as far as bedding goes for years to come. Whenever we move or update his room, I'm pretty sure we'll be picking out wall colors, curtains, and other artistic additions that coordinate first and foremost with his Reversible VelvetLoft And Sherpa Comforter and Sham Set! Looking for a new bedding set for someone in your family? Or maybe even one for yourself? The Reversible VelvetLoft and Sherpa Comforter and Sham Set comes in the navy blue color pictured above, and also in four other gorgeous colors! Looking for something different? Click HERE to check out all of the other bedding and fabric products from Berkshire Blanket! You won't be disappointed!